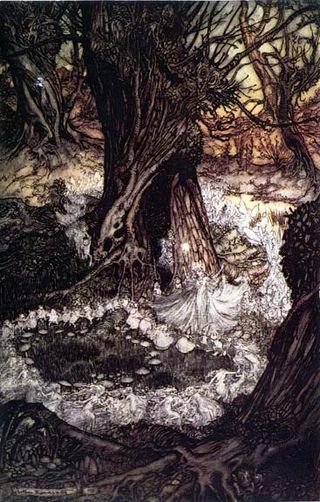 A fairy roundel, one of Arthur Rackham’s illustrations for A Midsummer Night’s Dream. The Sun is a pilgrim on a year-long journey that begins where it ends and ends where it begins. It’s a cycle, of course, and a spiral too. And within that solar cycle — above and below it perhaps — are the cycles, longer and shorter, of the planets. Especially there is the nebulous, changing Moon, who brings the light of the Sun through all 12 signs each month, more or less. Tomorrow, we reach a pivotal point in the Sun’s journey — one of the four corners of the year — the solstice. We call it Midsummer, but really it is the change in season from lush late spring to high summer here in the north. The Sun enters Cancer tomorrow late in the afternoon. A medieval zodiac held within the starry sky by angels. Cancer is one of the Cardinal signs that hearken the start of a new season. There are four of these; the first is Aries who awakens spring at the equinox. 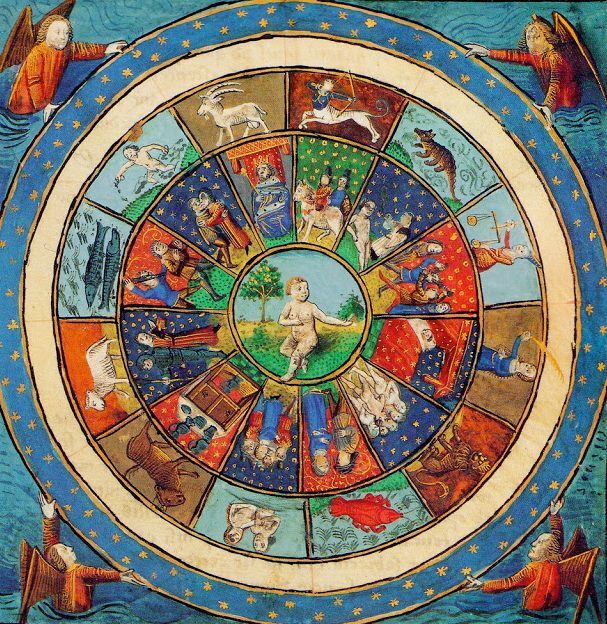 If you count the wheel of the year from the equinox, then Cancer is the first water sign and the second Cardinal. Think of these first four signs — Aries, Taurus, Gemini and Cancer — together as a group. Each represents one of the four elements — Fire, Earth, Air and Water. The two in the middle are Fixed and Mutable respectively, but they are sandwiched by Cardinals. As the Sun travels through this part of the sky, he is in the childhood of the Zodiac. Aries is the baby, Taurus the toddler, Gemini and Cancer both children. Everything is fresh and new, and at Midsummer this freshness and newness reaches a magical zenith. The world reaches a singing vitality in the Northern Hemisphere at least. After the excitement of Aries, the wonder of Taurus, the thrill of Gemini, we reach the enchantment of Cancer…. no wonder they say you can see fairies tonight.